In second grade, I read "Ben Franklin of Old Philadelphia" by Margaret Cousins. The book left me enthralled by the life of one of the greatest thinkers in American history. From birth to death, Franklin led a complex and interesting life. Benjamin Franklin was a scientist, inventor, writer and philanthropist. He published "Poor Richard's Almanack," invented bifocal glasses and a stove bearing his name, contributed to the understanding of electricity, organized the first lending library in America, raised funds to build a city hospital and started a college. Did I mention he is also the only Founding Father to have signed four of the documents essential to establishing the United States? The Declaration of Independence (1776), the Treaty of Alliance with France (1778), the Treaty of Paris, which ended the Revolutionary War (1783) and the U.S. Constitution (1787) all bear his signature. 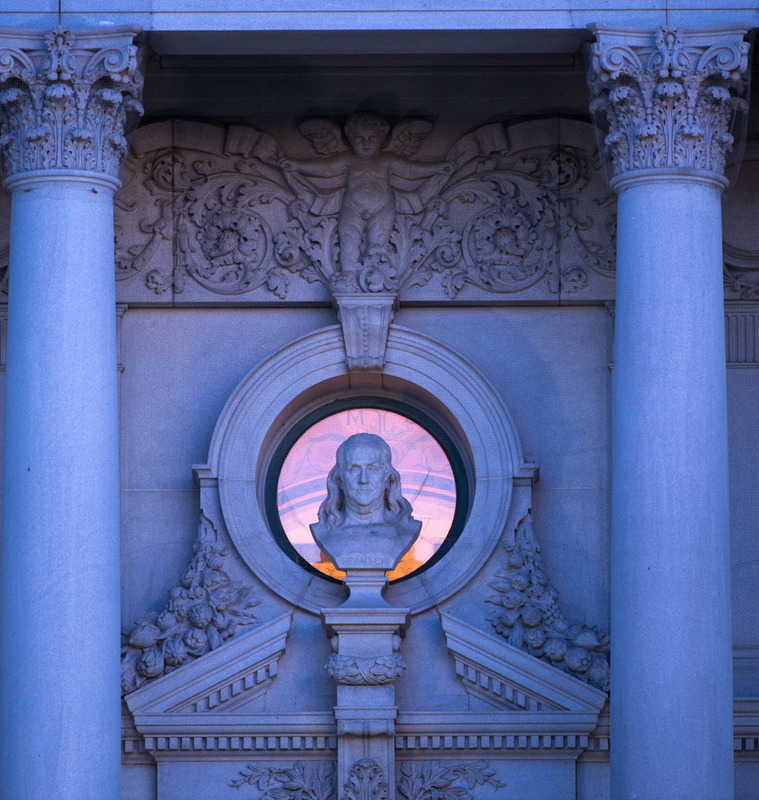 On my first day working for the Architect of the Capitol, I noticed a bust of Franklin in the window of the Library of Congress' Thomas Jefferson Building while walking across the East Front Plaza of the U.S. Capitol Building. Seeing his likeness rekindled my childhood interest in Ben of Philadelphia. 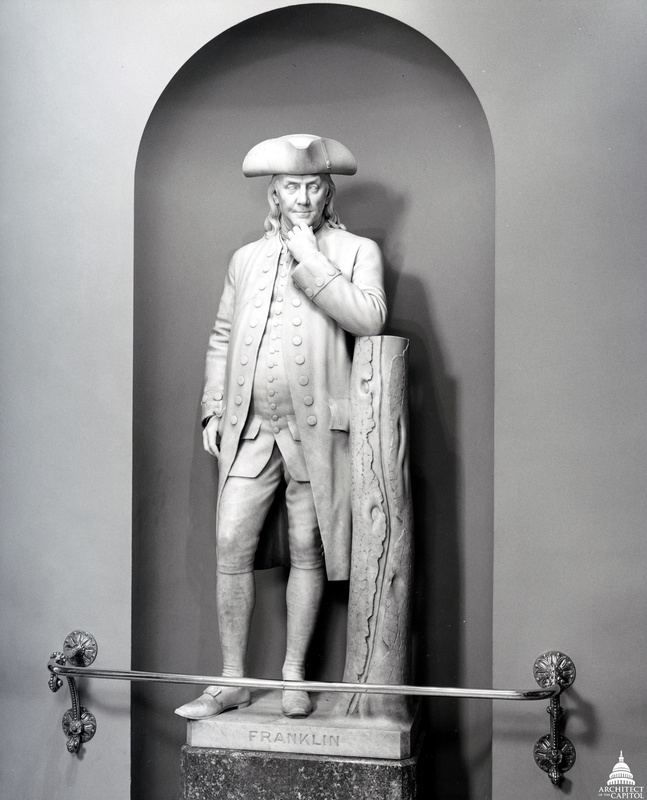 Franklin's image is found in art throughout the Capitol Complex. On the first floor of the U.S. Capitol's House wing, elaborately decorated walls and ceilings were designed by artist Allyn Cox to include historical scenes, portraits and maps related to the growth and development of the United States. Known as the Cox Corridors, Franklin appears in the Great Experiment Hall as part of the paintings, "The Constitutional Convention" and "The Declaration of Independence." World-renowned Capitol artist, Constantino Brumidi also frequently painted Franklin. 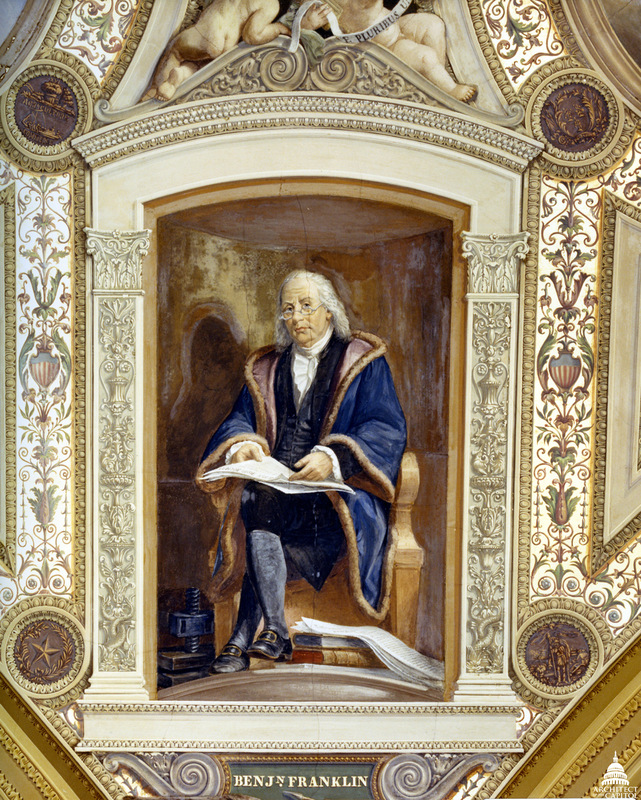 On the Senate-side of the Capitol Building, Franklin can be seen on the ceiling of the President's Room sitting in a chair and holding papers. A portrait medallion of Franklin is in the North Corridor of the first floor of the Senate wing of the building. A lunette of Franklin (cover photo) is above a door of the modern-day Senate Committee on Foreign Relations. It was the room originally used by the Committee on Post Offices and Post Roads, a fitting location to honor America's first Postmaster General. In the watercolor "Reading of the Declaration," Franklin can be seen on the steps with Thomas Jefferson and John Adams presenting the document to colonists. Brumidi's ambitious masterpiece, The "Apotheosis of George Washington," depicts George Washington rising to the heavens flanked by symbolic and historic figures. 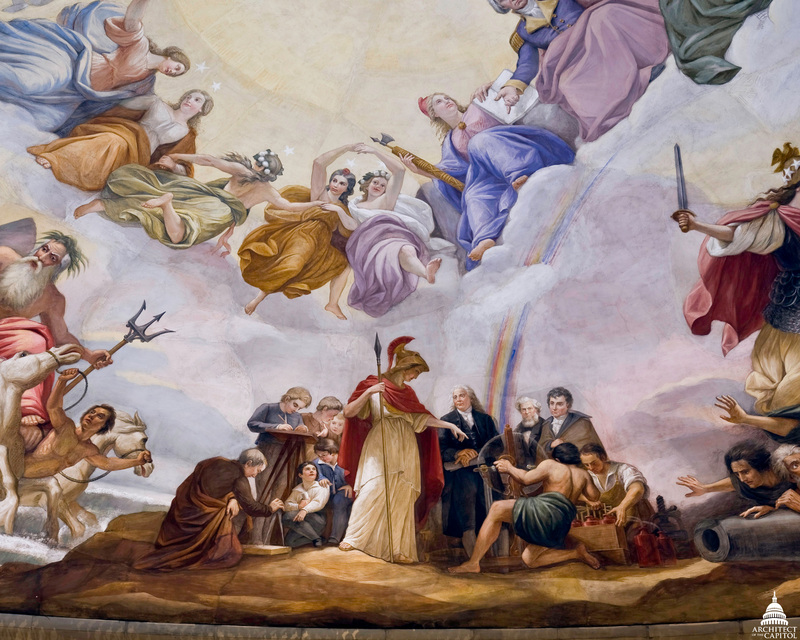 Located in the iconic Capitol Rotunda, the painting also includes Benjamin Franklin in the Science grouping being taught by Minerva, the Roman goddess of wisdom. Howard Chandler Christy's painting of the signing of the United States Constitution and John Trumbull's "Declaration of Independence" include old Ben. Christy's painting depicts Independence Hall in 1787. Eighty-one-year-old Benjamin Franklin is seated in the center of the piece. Trumbull's depiction of the Franklin is less obvious, but no less important. He is standing with other members of the committee that created the first draft of the Declaration of Independence in 1776. An etching of Benjamin Franklin by Henri Lefort, as well as, a marble statue by Hiram Powers (above) also grace the Capitol complex. More than 220 years after his death, Franklin remains one of the most celebrated figures in American history. The many pieces of art in the Capitol Building that include his image reflect his immense impact on our nation's development. This is a wonderful article. I walk by many of these images everyday and did not realize the number of times Franklin shows up throughout the Capitol. I definitely rekindled my interest! Great piece! I, too, have had a bit of a fascination with Benjamin Franklin since childhood. After visiting DC for the first time last year and touring the Capitol, now I know a few more things to see on my next visit!